Before we discuss on different quadrilaterals like the Rhombus, this is necessary to understand first what a quadrilateral is? This is a polygon with four sides, four vertices, and the four angles. The sum of its interior angle would 360-degree. A quadrilateral in simple terms has four sides of different length and angles of different measures. It can be square, rectangle or rhombus etc. 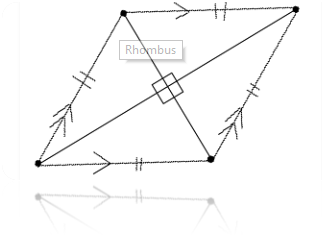 In this article, we will focus on Rhombus, and how to calculate its area and the perimeter. A rhombus is a quadrilateral whose four sides are equal and opposite sides are parallel. Hence, if you know the measurement of a single side then all other sides can be calculated automatically. One important term associated with rhombus is altitude that does not explain about the height but tells you how high it is. And the opposite sides connecting each other will form the diagonals. They can be given any name based on your convenience. Generally, they are written as d1 and d2 in mathematics. There are three popular ways to calculate the area of the rhombus in common practice. As we discussed earlier, the rhombus is a quadrilateral with four equal sides and it can be projected on two – dimensional plane where all 4 sides are equal and congruent in nature. The other name for Rhombus is an equilateral triangle having four sides equal in nature and the dimensions. Further, opposite sides are parallel so they can be named as parallelogram too. However, when all four sides are equal then it is a Rhombus where opposite angles and equal and diagonals bisect each other at the right angles and diagonals bisect the opposite vertex angles too. When diagonal divide the rhombus, it can be seen as two congruent triangles too. As soon as rhombus is concerned, this is a flat structure with all four sides are equal in length and aligned at right-angles. It looks like a diamond shape and total distance covered through the border of a rhombus is named as the perimeter of the rhombus. Opposite sides have to be parallel. The altitude is a distance at right angles to two sides. The diagonals of a rhombus bisect each other at 90 degrees. Where ‘a’ is the side of Rhombus and all sides are equal in length so it is multiplied by four to calculate the perimeter. d1 and d2 are the diagonals of the rhombus bisect each other 90-degree angle.